Vouwwow in the park Written on November 30, 2009, by Ingeborg. 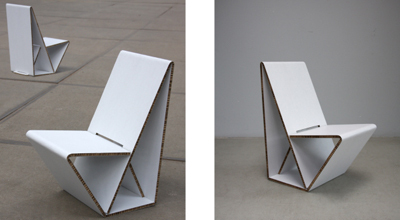 A cardboard strip that is easy to carry, easy to fold into a chair and easy to produce. Vouwwow can be taken to the park or an event, anywhere that you would want a chair. I can also see temporary events use this cheap transportable chair. Vouwwow by Maartje Nuy and Joost van Noort won the Thonet / Mart Stam prize for innovative chair design.